Ahem... yes... well... guess what? To all on my FList who are, have been, or will be affected by the storm, stay safe! I will keep you all in my thoughts! I know I never posted this, but in July my oldest and dearest cat, Eule, was hit and killed right out on the main road passing by our house. It happened about 5 or 10 minutes before I got home, because everything was still... fresh. As you can imagine, that hit me pretty hard. She'd been a very special character and I loved her very much. Not, that I don't love the other ones, too, but occasionally you have one that you're just closer to. I'd asked an artist over on DA to do a commission for me. It was just a scene that had suddenly popped into my mind. As sometimes happens with these things, it didn't leave me alone. Instead, the scene insisted on actually being written out. Now, I've gotten *terribly* out of the habit of writing... So this might be a little... bumpy, where the writing's concerned. 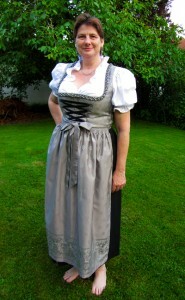 And no, I didn't buy it to wear to the Oktoberfest. I avoid that event like I'd avoid a plague of locusts mixed with vitriol. This morning, we had one hell of a snowstorm. Only made it to the train station by driving more or less at walking speeds. Snow everywhere, with large drifts right across the road. So, of course, the entire train system breaks down. I get to the station, park my car, then fight my way to the platform through the wind and there I read: "trains delayed up to 80 minutes". O.o 80 minutes? Okaaay... However, since today I'm attired in proper winter wear (thick thermal trousers over my normal ones, my thick down coat, gloves, boots and woolen hat), I wander on through to my platform. I was just thinking that I'd see what I could see. And what I saw was a sign saying that a train heading for Munich was supposed to show up soon. So I waited. Then the train came in, almost at the time that my usual train arrives. I get on, after making sure that it stops at my change-over point. I say to the conductor, oh, it's great that you're so on time. And he says, sorry, we're not the 8:52 train, we're the *7:52* train! >.> It was an hour late... It seems that my regular train hadn't even left it's starting point yet.